Damaraland Camp is situated in the Huab River Valley in one of the best wilderness areas in Namibia, offering endless vistas across stark plains, ancient valleys and a stunning ochre-purple mountain backdrop. Ten large en-suite, adobe-style thatched units (including a family unit) are raised off the ground, each with a walk-in dressing area and a large deck on which to sit and contemplate the desert. Activities include nature drives and walks during which guests can see species such as desert-adapted elephant, gemsbok, kudu and springbok, as well as rare succulent plants. Further afield, ancient rock art and geological wonders dot the area. The largest free-ranging population of black rhino in Africa can be found at Desert Rhino Camp. 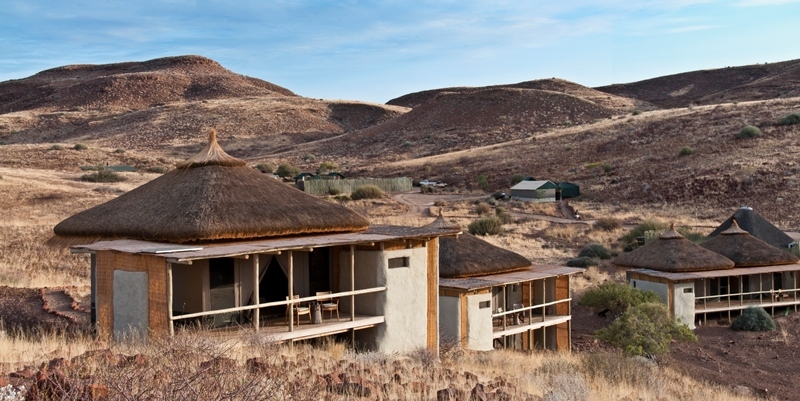 Desert Rhino Camp lies amongst rolling, rocky hills of the 450 000-hectare Palmwag Concession, this region is marked for its tranquil, minimalist beauty, surprising wealth of arid-adapted wildlife. Set in a wide valley, accommodation at Desert Rhino Camp consists of eight raised Meru-style canvas tents with front verandas to take in the sweeping views in front dotted with scattered euphorbia and ancient welwitschia plants, and the dramatic Etendeka Mountains. Activities include rhino tracking on foot and by vehicle with Save the Rhino Trust trackers, full-day outings with a picnic lunch, birding and nature drives. The Hansa Hotel – nestling in the very center of the charming little town of Swakopmund offers you a feeling of being enveloped in a luxurious and sophisticated hospitality with a satisfying blend of both classic atmosphere and truly elegant interior, matched with friendly and personalized service. 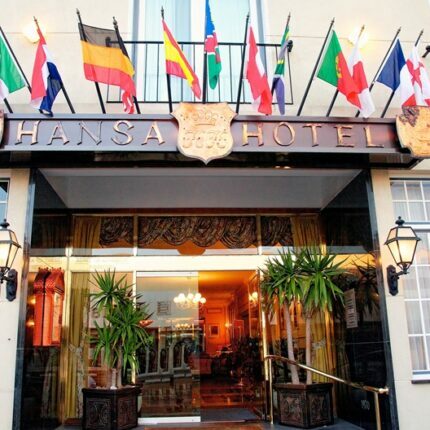 The Hansa Hotel provides only the finest, most luxurious accommodation. The hotel boasts 5 Family units, 4 Suites and 49 Twin/Double rooms. Centrally situated, the hotel serves as the perfect gateway to all tourist amenities which Swakopmund and the surrounding area has to offer, from sandboarding some of the highest dunes in the world to big game viewing in one of Namibia’s world-renowned game parks. 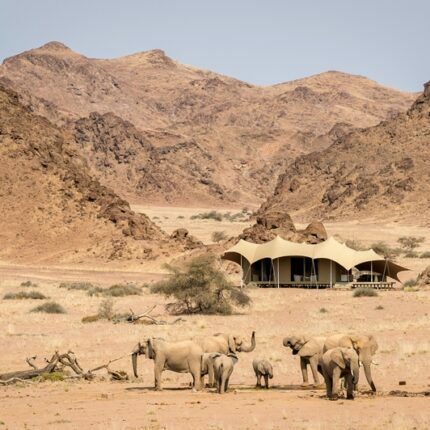 In a remote area of the Kaokoveld, in a land of bare mountains, gravel-strewn plains and dry riverbeds that draw fascinating wildlife, lies Hoanib Skeleton Coast Camp. 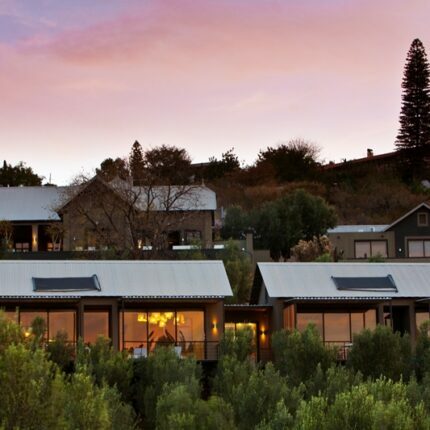 Both the eight large en-suite tents (including one family unit) with shaded outdoor lounges and the main area and swimming pool look out over rugged scenery: a wide valley that slopes down to the almost-always dry Hoanib River. Explorations of this isolated yet diverse area take place via game drives along the riverbed’s narrow ribbon of vegetation, where a surprising wealth of desert-adapted wildlife can be found: elephant, giraffe, gemsbok and springbok, with glimpses of lion and brown hyaena. 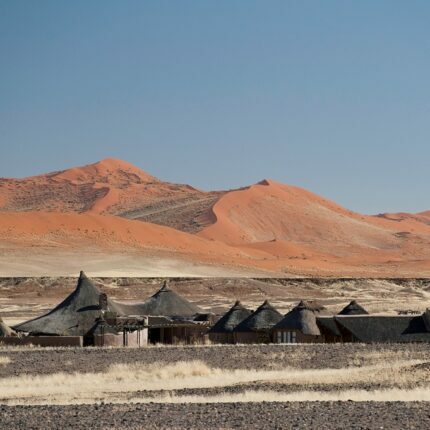 Hidden at the foot of the majestic Sossusvlei dunes, a private entrance to Namib Naukluft Park makes Kulala Desert Lodge the closest location to Sossusvlei, while magnificent views of its famous red dunes, mountainous scenery and vast open plains make it the most spectacular. Kulala Desert Lodge comprises 23 thatched and canvas “kulalas” (including 3 family units) with en-suite bathrooms and verandas. Activities impress guests with the overwhelming magnitude, solitude and tranquillity of the desert and include private tours to Sossusvlei, scenic nature walks and drives to view the desert’s fascinating flora and fauna. At extra cost, it is also possible to experience the area on a hot air balloon safari. 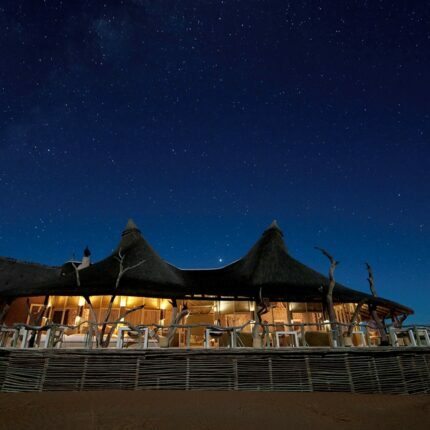 Little Kulala is a luxurious desert retreat situated in the private 27 000-hectare (67 000-acre) Kulala Wilderness Reserve – the gateway to Namibia’s Sand Sea with its towering dunes and clear starry skies. Accommodation consists of 11 climate-controlled, thatched “kulalas” (the word means ‘to sleep’) which merge impeccably into the desert landscape, each with private plunge pool, both indoor and outdoor showers and a rooftop star bed for romantic star gazing. Varied activities aim at acquainting guests with the splendour and stark beauty of the Namib Desert, with excursions to Sossusvlei and nature drives and walks providing awe-inspiring views of desert-adapted wildlife and plants. A balloon safari (at extra cost) offers a unique experience soaring silently above the desert, while eco-sensitive quad biking explores this beautiful area on the ground. Designed for privacy, luxury and an intimacy with the land, Little Ongava is arguably one of Namibia’s most luxurious accommodation with pristine views across the Ongava plains. This intimate camp has only three spacious suites each with its own plunge pool, en-suite bathroom, “sala”, and outdoor shower. The lounge and dining areas have wonderful views of a productive waterhole below the camp, the open deck allowing for relaxed, stylish dining under the African sky. Guests at Little Ongava share a dedicated guide and vehicle, ensuring the best possible nature experience at one of Africa’s great wildlife destinations. 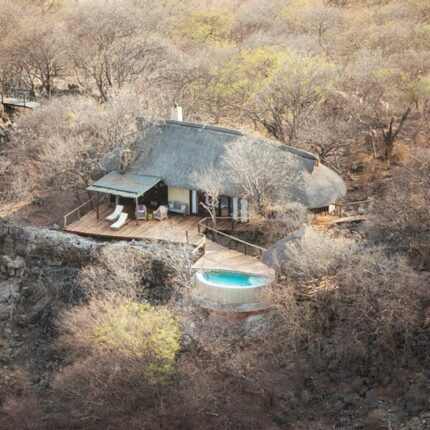 Immersed in the African Mopani bush, Ongava Tented Camp is a natural extension of this wild, wonderful landscape. 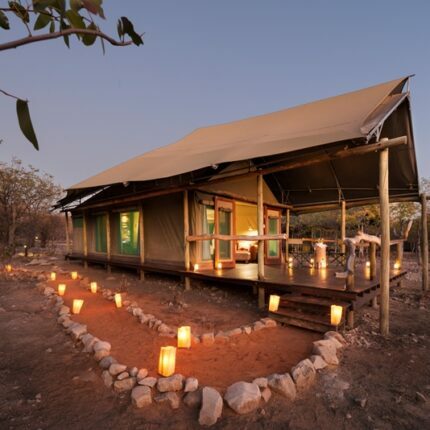 The classic safari style camp is tucked in a hidden valley at the foot of a dolomite hill in Ongava Game Reserve bordering Etosha National Park. Eight large comfortable Meru-style tents all have en-suite facilities, open air showers and private verandas; the family unit sleeps four. Ongava holds one of the largest rhino custodianships for the Namibian government in the country and is one of the few private game reserves in southern Africa where guests can see both black and white rhino. 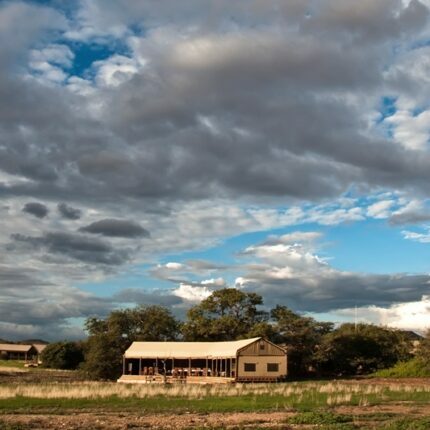 Undoubtedly one of the most remote camps in Southern Africa, Serra Cafema is located in the extreme north-west of Namibia on the banks of the Kunene River in the Hartmann’s Valley. Serra Cafema is an intimate, peaceful camp inspired by the area’s Himba people, with a unique mix of rustic and luxury elements, and nestled amongst shady Albida trees. Accommodation consists of eight wood, canvas and thatched villas on spacious, elevated decks blended smoothly into the picturesque surroundings. Activities here are varied, including boating (water levels permitting), walking, viewing breathtaking landscapes, as well as carefully guided quad-bike excursions that tread lightly on the dunes. 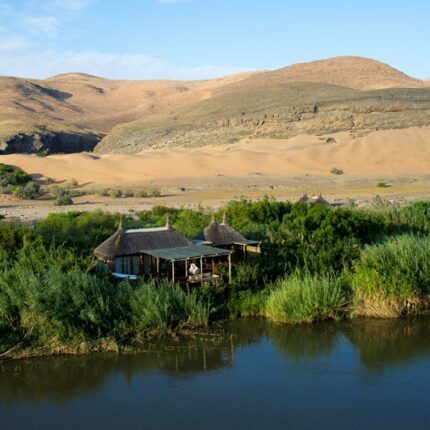 Take a breather from your hectic schedule and reconnect with yourself and with nature at Sossusvlei Desert Lodge. Surrounded by the mountains and sand dunes of the Namib Desert, Sossusvlei Desert Lodge is an escape to the world as it should be. Sheer silence, total tranquillity and romantic luxury. Cradled against ancient mountains, the ten stone and glass desert villas of Sossusvlei Desert Lodge blend the grandeur and solitude of the Namib with sophisticated elegance and comfort. When night falls, the resident astronomer reveals the mysteries of the stars in their state of the art observatory. Strand Hotel Swakopmund is the perfect venue for travellers wanting to explore Swakopmund. 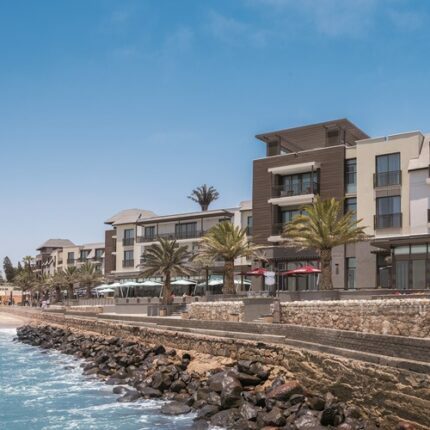 The Strand Hotel Swakopmund is located directly on the mole (promenade) in Swakopmund, surrounded on three sides by the Atlantic Ocean, with direct access to the main beach in town. With its extensive, unique and creatively entertaining Restaurants, Bars, Deli, Lobby-Lounge, Sea Facing Terraces, Beach Kiosk and state of the art Conference & Banqueting Center, all set on the Mole, a historic and iconic site surrounded by Ocean on three sides, the Strand Hotel Swakopmund is a social epicentre and destination in itself for all visitors to and residents of Swakopmund. The Olive Exclusive – the first ultra-luxurious sanctuary of its kind in the Namibian capital – is cool, contemporary and stylish but with a warm heart and authentic African soul. Its sleek, modern lines are complemented by organic textures, natural furnishings, an eco-friendly approach and dedicated personal service. The seven suites are individually decorated so each reflects a different region in Namibia, and each has its own lounge area with fireplace and dining room, for private dining. The Olive Exclusive boasts a quality restaurant featuring a seasonal menu, with inventive signature dishes. The fully stocked bar also features a classic selection of fine whisky.